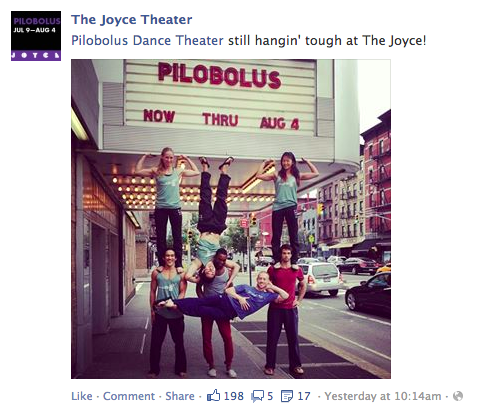 Especially with the introduction of social media, what arts organizations used to call “marketing” is now more accurately described as “patron relationship building” (or what I like to call “breaking the fifth wall” [see below]). In this article, we’ll examine what makes a great Facebook or Twitter post—one that advertises your art effectively, grabs attention, and embraces the medium. If your post asks people to take action—especially if that action is “buy a ticket”—be sure that’s clear. Always include an easily visible link. Don’t assume your fans will find it on their own. 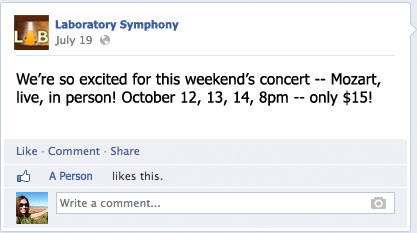 Here’s a great example of a post with a clear call to action. 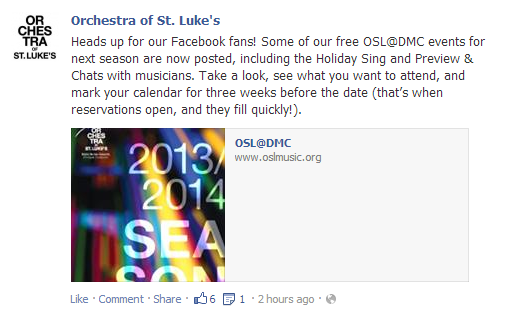 Tickets for these Orchestra of St. Luke’s performances aren’t available yet, but this announcement provides the first step to a purchase, because it is a link to the OSL web site and schedule of concerts. People can “mark their calendars” for the future. 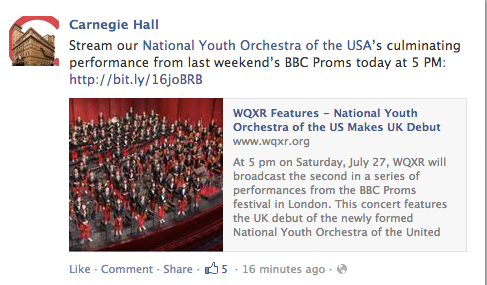 Carnegie Hall tweets a streaming video url of a recent performance—it’s not hosted on its own web site, but they provide a link to the page of the radio station that’s offering it. 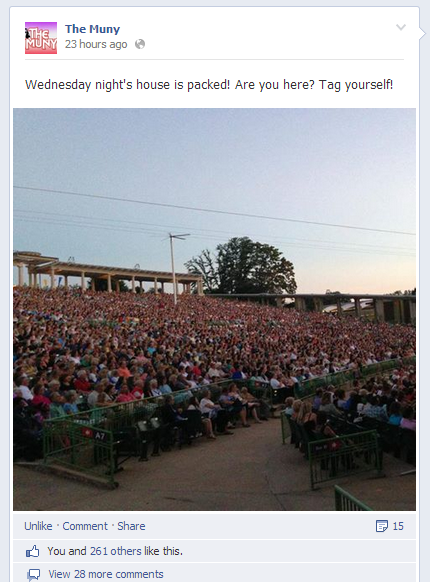 The Facebook gurus at the famed St. Louis MUNY are real pros (we’ll see another example below), but this post showing the packed house for Mary Poppins is a missed opportunity, because it could have included a link to buy tickets. In addition to making it easy for people to take action, including links in your posts gives you another way of tracking and measuring your success. Go beyond Likes and comments (which you can track using Facebook Insights and see how much traffic your social media posts are driving to your site (which you can using Google Analytics or a similar web site tracking platform). If your data shows that posts with certain kinds of images or language far out-perform others, you’ll know you’re hitting the mark with your audience and should continue moving in that direction. Pinterest, Tumblr, Instagram—have you noticed how all the popular social media sites are heavily image-based? That’s nothing but good news for arts organizations. 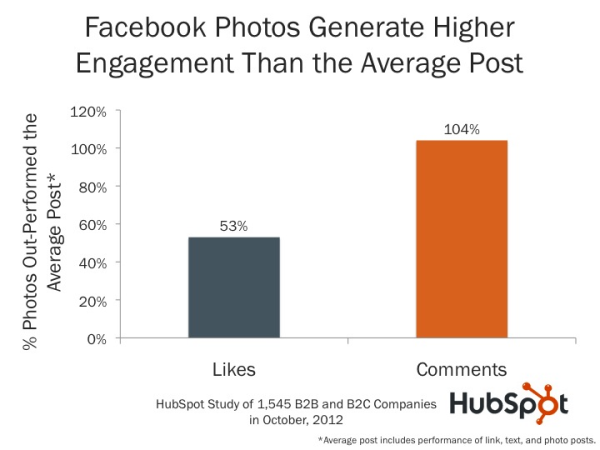 A photo can communicate so much about what your organization has to offer—and, as an extra bonus, Facebook posts that include images consistently get re-shared and Liked at a higher rate than text-only posts (and according to Hubspot, they get 104% more comments!). 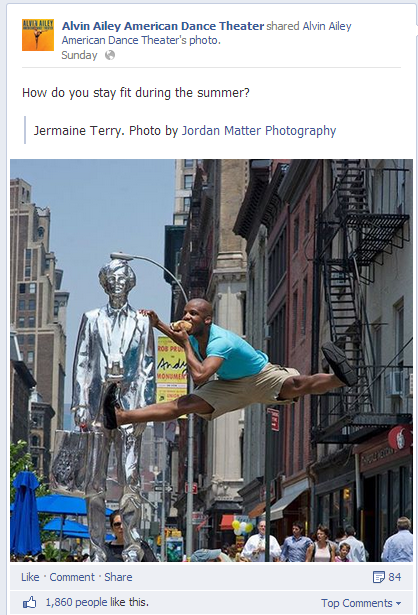 You can use images to capture and market the actual experience of your artform; Alvin Ailey Dance nails it with this dynamic, exciting photo that—even though it’s shot out on the streets of New York, not in their venue—demonstrates exactly what it’s like to see the dance company perform. Hashtags aren’t just for Twitter anymore. As you can see in this example, Facebook now turns hashtags in posts into links that let you view a whole stream of updates on the same topic. 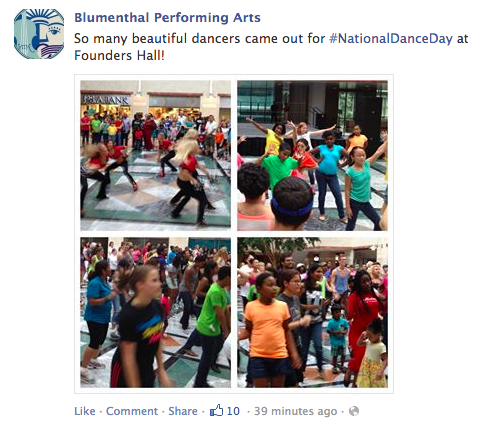 Here, the Blumenthal PAC adds its voice to the #NationalDanceDay tag. Adding a hashtag like this one can dramatically increase the reach of your post. 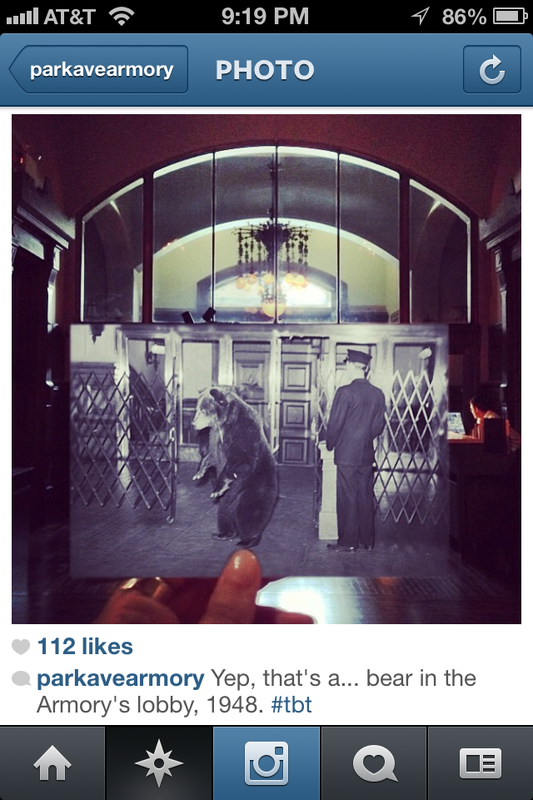 “Throwback Thursday” is a meme/trend that originated on Instagram, as users started posting old photos on Thursdays and tagging them with “#tbt.” The Park Avenue Armory has seized the Throwback Thursday opportunity by combing their archives for photos that help tell fans the story of its past. 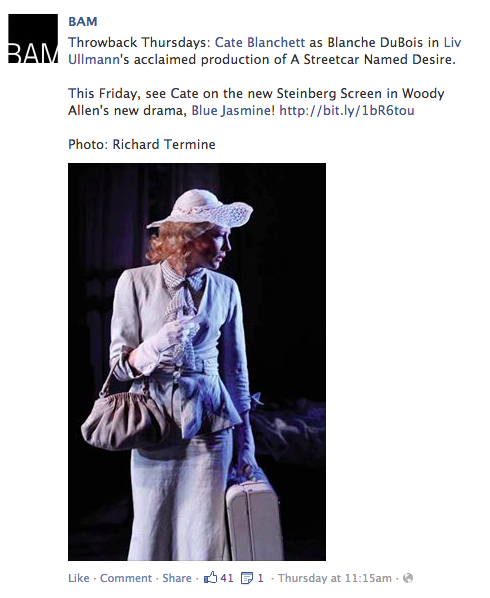 BAM jumps on the Throwback Thursday bandwagon with an old shot of Cate Blanchett—and just happens to mention that she’s part of the cast of a movie playing at the BAM Cinema right now. Relevant and useful for selling tickets. When you do post a marketing message, keep all of the above tips about links and images in mind, and make sure it’s more than just an announcement that the event exists. That’s where the Laboratory Symphony examples really fail. Describe why someone should want to come to your event—build excitement by offering your patrons a glimpse of the experience itself. 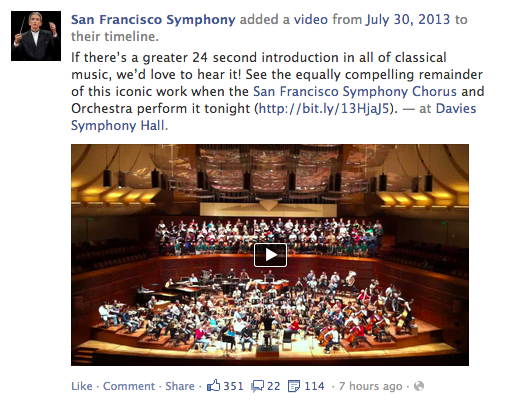 The San Francisco Symphony brings it all together here: A photo (actually a still from a great video clip), a link to purchase tickets to this specific event, a location tag so everyone knows where this is happening... and most importantly, excellent copy, making a “big fat claim” that invites a response. 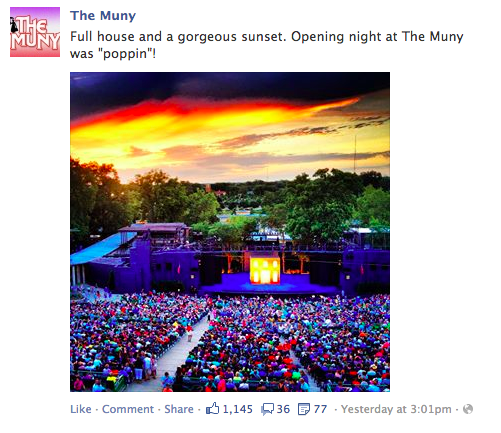 Check out the enormous number of Likes, comments, and re-shares the post generated. you’ll be on your way to success. You’ll find that social media can dramatically change the way you establish connections with your patrons, and motivate them to talk about you with their friends, expanding your organization’s reach and influence. Michelle Paul is director of product development for Patron Technology, has been in charge of building and improving PatronManager CRM since its conceptualization and launch. A close observer of arts marketing and management trends, Michelle has presented sessions at NAMP, INTIX, ArtsReach, and other conferences. She is the co-author of Breaking the Fifth Wall: Rethinking Arts Marketing for the 21st Century.